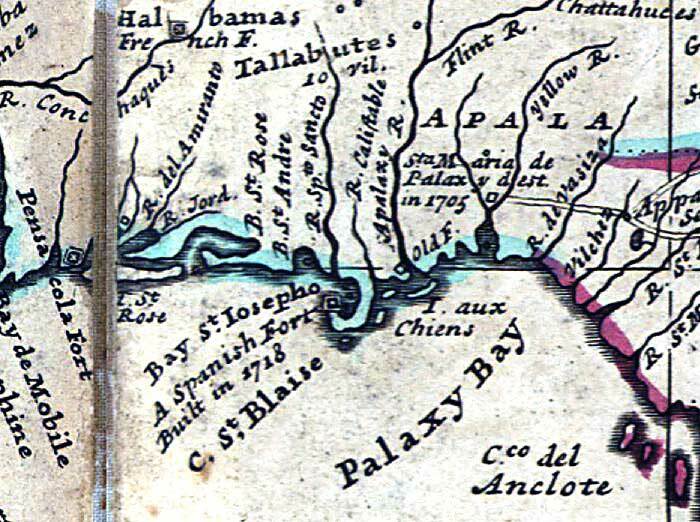 Description: A detail from the 1719 Moll World Map showing the Palaxy Bay (Apalachee Bay) of Florida, coastline, major rivers including the Apalaxy River (Apalachicola River), and settlements including Pensacola under French control, Santa Maria de Palaxy (San Marcos de Apalache and St. Marks) which is shown as deserted in 1705. This detail also shows the location of 10 villages of Tallabutes (Tallahassee? ), a Spanish fort built near C. St. Blaise (Cape San Blas) in 1718, and three other forts under French control. Also shown are the islands I. aux Chiens (Dog Island) and C.co del Anclote (Cedar Keys). This map shows the claimed territories of France outlined in blue, including Pensacola, St. Marks, and lands west of the present day Wacissa River, and Spain in red.